I sometimes travel to Norway for my work and the tax free shop on Oslo Gardamoen airport very interesting for whisky drinkers! The normal HUGE Norwegian taxes are thrown right out off the window! 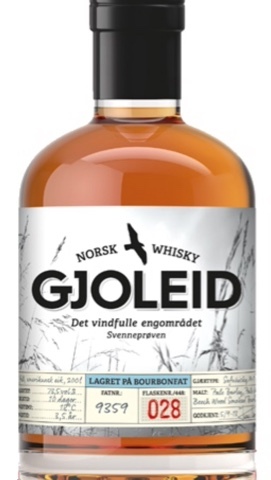 One of the bottles I hope to find there is a Norwegian Single Malt whisky called Gjoleid. It is made at the Arcus Distillery. Some earlier versions were bottled at 3,5 years old. I first learned of Gjoleid single malts from the world whisky atlas. I read the 73% vol alcohol percentage and my reaction was:"wow"! Now I think the 73% might have been a typo, since I can only find 43% references in the very few internet sites that even mention this dram. I cannot find to many references on the internet that are in English, but at the last whisky festival in Oslo there seems to have been a presentation and some people blogged about it. I will try to find the blogs and see if new expressions have become available. Some tasting notes for an earlier version of Gjoleid can be found on Norwegian blogs, in English! I will try to get a hold on a current version of Gjoleid and see if I can review it.